Happy Thursday everyone! Robin here with another inspiration for Dies R Us; your super store of everything dies! There is definitely a touch of Fall here in SoCal, finally…OK, it's still in the 80's but the mornings are 60! I'll take what I can get right now, LOL. 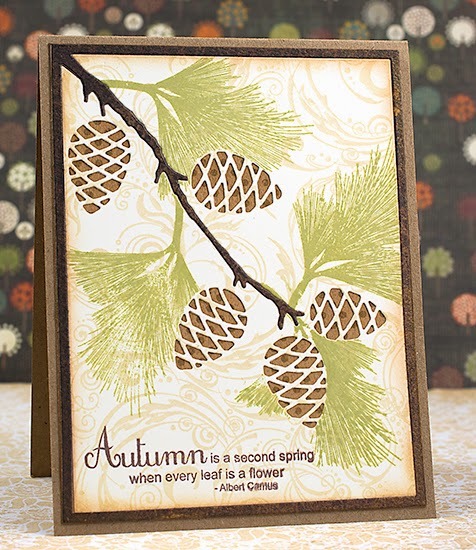 This simple die, Pinecone Frame from Memory Box, inspired my design for the week. This die makes two cuts at once, one is a frame with branch and the other is a background with pine cones. I cut once with a neutral paper and again with a dark brown paper. 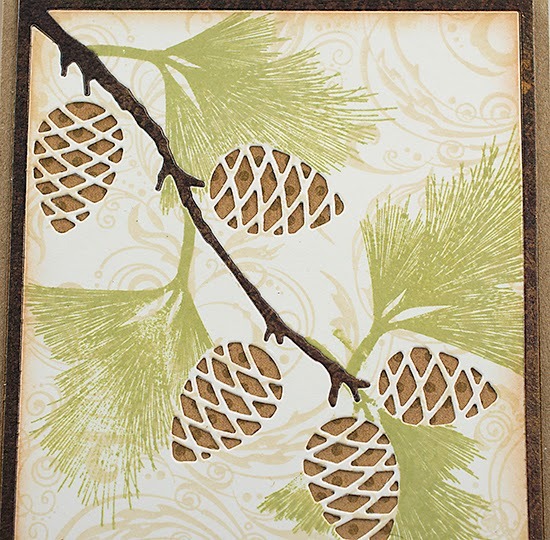 The neutral paper was then stamped with an all over pattern; I then stamped the pine boughs down the length of the branch, layered the stamped paper onto a polka dot brown cardstock and then "inlayed" the dark brown frame and branch. Check out the many dies carried by Dies R Us, seriously huge selection! Plus shipping is free with a purchase of $35 or more, can't beat that. You have no excuses for not finding "that" special die. Another gorgeous card! I really, really love this die! Another for my wish list. If you keep making such beautiful cards, that list will be as long as Santa's! Oh Robin I LOVE this fall creation! Just beautiful!